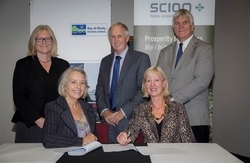 Scion and Bay of Plenty Regional Council have signed an agreement to build an innovation centre at Scion’s Te Papa Tipu Innovation Park. The centre’s purpose is to foster innovation in forestry and wood processing industries. The Rotorua-based Crown research institute successfully bid for funding through the Regional Council’s Regional Infrastructure Fund (RIF), a contestable fund set up to support economic development in the Bay of Plenty. Scion was allocated up to $2.5m from RIF’s inaugural funding round towards the construction of a proposed innovation hub for forestry and wood processing-related businesses. Scion’s project was one of four to receive funding in the 2013 RIF round. Since announcing the funding Scion and Bay of Plenty Regional Council have been working on contractual requirements for the project. Last night, representatives from Scion and the Regional Council signed a Funding Agreement to formalise the project. “This project has the potential to provide a significant boost to not only the Rotorua economy, but that of the wider region, bringing employment, economic benefits and innovation,” Regional Council Chief Executive Mary-Anne Macleod says. “The funding is essentially seed funding which will help get this project off the ground sooner rather than later, for the economic benefit of the region,” she says. Scion CEO Warren Parker says the funding will enable Scion to get going with securing tenants and, all going well, to have construction underway by late this year or early 2015. It is anticipated the building will be completed by December 2015. The Scion project is part of plans to expand Scion’s Te Papa Tipu Innovation Park, adjacent to its research campus on the fringe of Rotorua’s Whakarewarewa Forest and already home to about 30 forestry-related businesses. The new building will be a centre for both start-up businesses and small-to-large operations with the aim of fostering collaboration and innovation across the forest and wood processing value chain and with Scion. “The innovation centre is part of wider efforts to establish Rotorua as a forestry and wood processing industry centre of excellence,” Dr Parker says. “There is plenty of space in the innovation park for more like-minded operations to join those already located there. Bringing industry influencers and innovators together has the potential to lead to thousands of jobs as new ideas and technologies start to roll out of the centre. The Regional Infrastructure Fund is providing up to $2.5 million towards construction and fit-out of the planned 1000 m2 building. Applications for funding for the inaugural RIF round closed in February 2013 and successful applicants were announced last August.